Drowning is the number one cause of death for children between the ages of 1 and 4, but this rate is higher for children with special needs, including autism. For that reason, safety swim classes are something parents often seek out. But what if your child is terrified of the water, and experiences such severe stress he or she can’t overcome it to learn? You work with a trained swim dog, of course. A dog just like Cori. Even with his mother, this little boy couldn’t stop crying and screaming when in the water. But his cries turned to laughter and kisses when Cori joined him in the pool, and soon he was playing and paddling with Cori. This is Cori’s life work: Helping special needs children overcome their fear of the water. And Cori does this work at no cost to special needs families. Good dog, Cori! 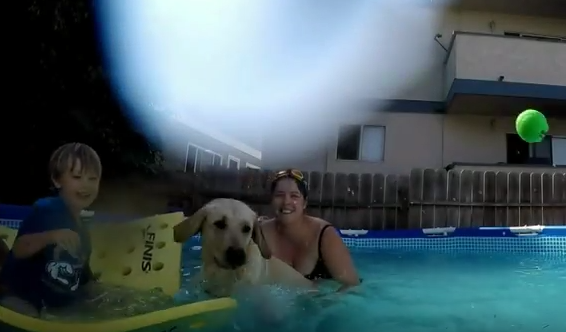 Learn more about Cori, her services, and her “big sister,” Ricochet the SURFice dog, here.